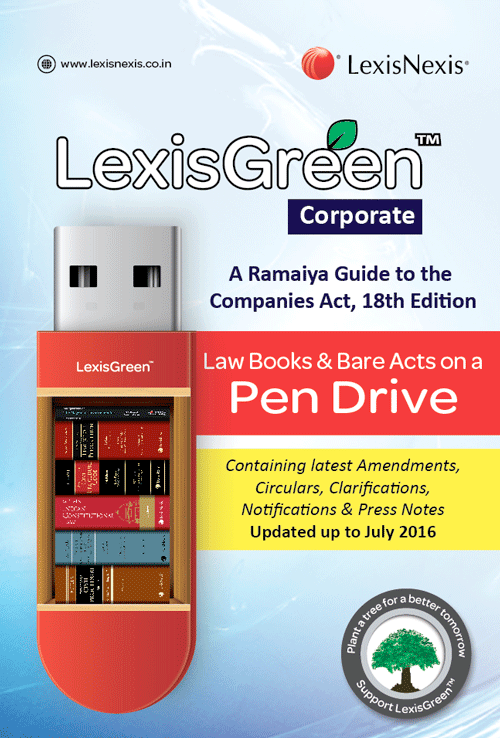 LexisGreen™ Corporate Pack contains ‘A Ramaiya Guide to the Companies Act, 18/e’ that has been the benchmark for reference and research on the Companies Act. With in-depth comparative analysis of Companies Act 1956 and Companies Act 2013, Corporate Pack also contains appendices relating to Rules and Regulations, Allied Legislation (SEBI Regulations, FEMA Regulations, Securitization and NBFC RBI Directions), Amendments, Circulars, Clarifications, Notifications and Press Notes updated up to July 2016. Comprehensive and authoritative commentary on the new Companies Act 2013. Appendices relating to Rules and Regulations framed under Companies Act 2013, Companies Act 1956, and Allied Legislation (SEBI Regulations, FEMA Regulations, Securitization and NBFC RBI Directions). Side by side analysis of Companies Act 1956 and Companies Act 2013. New Concepts/provisions introduced by Companies Act 2013 analyzed and discussed. For example: One Person Company, Changes in compliance norms for Related Party Transactions, Corporate Governance, Independent Directors, Audit Committees, Corporate Social Responsibility, etc. Commentary prepared by experts in corporate law. Diverse Contributor profile with rich experience in regulatory, compliance, litigation, transaction advisory role, as well as accounting and auditing. Contributors include, senior advocates, former member of the company law board, partners of the big four accounting firms, and top tier corporate law firms, company secretaries, and chartered accountants. The eighteenth edition examines the relationship between the Companies Act 2013 and the Companies Act 1956 and to address unique challenges/issues arising out of concurrent operation of two Acts and throws light on ambiguities and uncertainties in the law. Rules, Clarifications, Notifications and Orders issued under Companies Act 2013 and Allied Legislation (SEBI Regulations, FEMA Regulations, RBI Master Circulars, etc.) updated as on the date of going to press.